The ocean of ideas, teeming with words and numbers, is underpinned by a vast tectonic plate that’s powerfully transforming the language. It’s the force that gives rise to new continents of meaning, while it inters the remains of countless extinct species. We know its name, but we rarely think about it, and we certainly never visit. It’s just there, helping to clarify our words and numbers in an invisibly supportive way. But it’s one of the culture’s most unstoppable forces. It’s called Punctuation. At its leading edge, punctuation is volcanically active, giving shape to concepts that move far faster than words. Anyone communicating today has seen #topics and #themes and #categories identified this way, using a symbol that was intuitively understood and replicated even before it was first called a hashtag in 2007. The symbol and its meaning are now universally recognized, transcending even the locality of language, but their use is scarcely a decade old — an astounding accomplishment for a bit of lexical fluff, when you consider that the newfangled OMG was first recorded in 1917 (and in a letter to Winston Churchill, no less.) Similarly meteoric is the rise of @, not only in its initial evolution from grubby commercial symbol to digital thingum, but in its latest metamorphosis, which has left it poised to become a bonafide verb. Formulations like “write in or @ us on Twitter”¹¹ I owe this cheeky example to Kory Stamper, a lexicographer at Merriam-Webster. You should read her blog. may seem casual, or may be arch, but since they’re easily understood by the initiated, they’re grammatical fair game. Punctuation FTW! Between the symbols we live with and the symbols of yore is a third category, characters that are no longer considered ‘standard’ (by someone’s arbitrary standard), but are nonetheless still meaningful, and immediately understood. If you’ve ever addressed correspondence to someone in the care of someone else, you might have used ℅, a pretty hanger-on that I think has a place in the right kinds of typefaces, but one that should by no means be considered a typographic requirement. But the best and most active of these living fossils is a personal favorite: it’s the Numero, known to us by the monogram Nº. The Chicago Manual of Style unequivocally favors ‘no’ over ‘#’ when listing the issue number of a periodical: “When the issue number is given, it follows the volume number, separated by a comma and preceded by no.”³³ The Chicago Manual of Style, 15th Edition, §17.163. And this introduces an interesting complication for Russian language periodicals, or those published in any language that uses the Cyrillic alphabet, because Cyrillic does not contain the letter N. It’s for this reason that typefaces that include Cyrillic alphabets always include the numero symbol, which is why you’ll find them in both Whitney and Gotham. 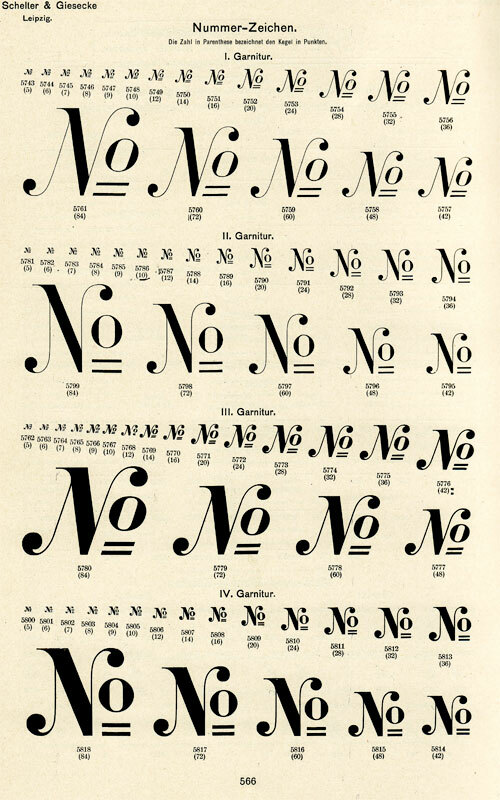 But the place you’ll find the greatest concentration of numero symbols in our library is in the Numbers collection, where I insisted upon them simply because they’re delightful. 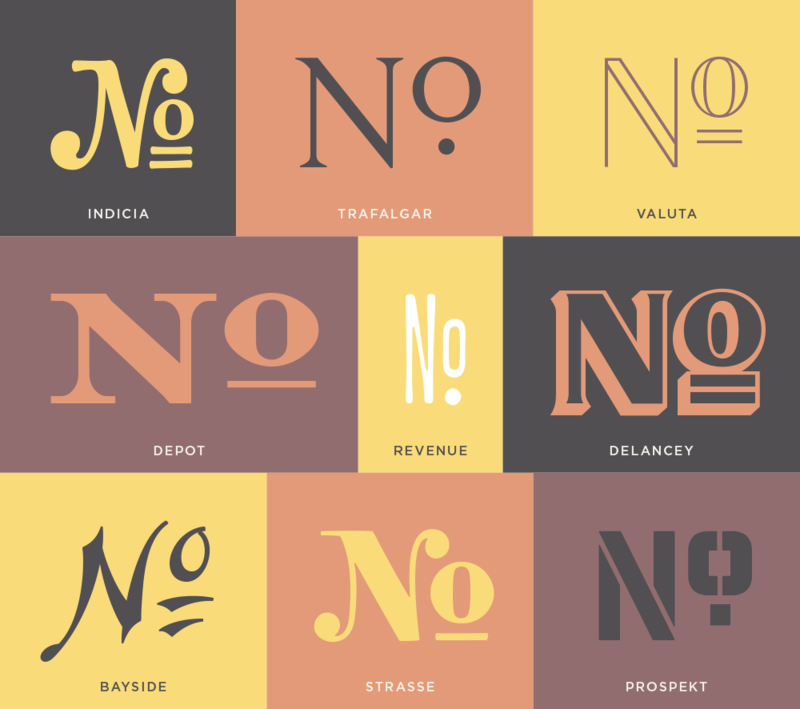 The typefaces in this collection interpret many different traditions in lettermaking, including rubber stamps, cash register receipts, railway car numbering and street signs, and in each of these environments you’ll find the numero. Many of these styles trace their origins to the nineteenth century, when numbers were more commonly introduced by Nº than #; others in the collection never used this symbol, but their styles seemed ripe for decoration. We recently had this same impluse with the Inkwell collection, which includes pen-drawn numeros in all forty-eight of its styles. The actual H&Co FAQ, in case you're looking.